Atrial arrhythmias, including atrial fibrillation and atrial flutter, are common in patients with pulmonary hypertension and are closely associated with clinical decompensation and poor clinical outcomes. The mechanisms of arrhythmogenesis and subsequent clinical decompensation are reviewed. 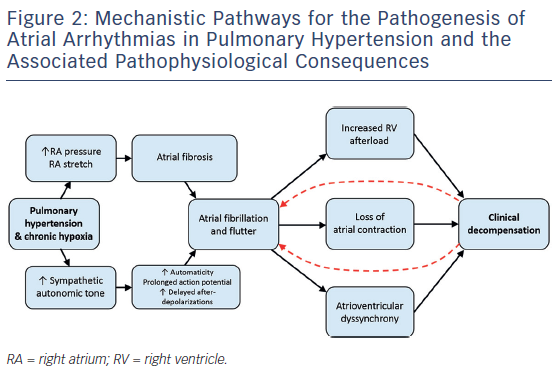 Practical implications and current evidence for the management of atrial arrhythmias in patients with pulmonary hypertension are summarised. The altered structural and electrophysiological properties of the left atrium in the setting of AF and left heart disease have been well described.15,16 In PH, enlargement of the right atrium (RA) is thought to reflect advancing disease and potential progression to right heart failure as elevated pulmonary and right ventricular pressures are transmitted to the RA.17,18 Observational studies suggest that RA pressure and chamber size are important risk factors for atrial arrhythmia development.9,10 Chronic RA pressure overload and stretching, along with chronic hypoxia, may alter the atrial substrate by promoting fibrosis and local tissue heterogeneities, which in turn predispose to a risk for AF.19 This is consistent with emerging data demonstrating a key role of atrial fibrosis in the pathogenesis of AF as documented by delayed enhancement on MRI.20,21 Figure 2 summarises potential mechanistic pathways contributing to the development of atrial arrhythmias in patients with PH. In addition to alterations of the RA substrate, derangements in autonomic tone may also play an important role in atrial arrhythmia development. Patients with PAH have been shown to have increased sympathetic activity,25 and reduction of this sympathetic input may improve functional status.26 The sympathetic autonomic system is recognised to play a significant role in the initiation and perpetuation of AF via enhanced automaticity, triggered activity and an increase in delayed afterdepolarizations, and may even represent a therapeutic target for AF.27,28 Using a canine animal model, Zhao and colleagues performed EPSs in animals with PAH and controls.29 Animals with PAH showed more AF/atrial flutter vulnerability and higher right atrial sympathetic nerve and beta1-adrenergic receptor density. Ablation of the right anterior ganglionic plexi (but not other intracardiac nerves) attenuated the arrhythmic potential, likely due to the withdrawal of local sympathetic input to the RA. The development of AF is considered an independent predictor of adverse outcomes in various cardiac conditions including heart failure with reduced or preserved ejection fraction, valvular disease, and hypertrophic cardiomyopathy.30–32 AF may be a marker of advanced disease or decompensated cardiac substrate, but it can also contribute to disease progression and exacerbation. Both are likely true in patients with PH. Atrial arrhythmias are strongly associated with markers of disease severity and deterioration in patients with PH. In the Tongers et al. cohort, 84 % of patients with atrial arrhythmias presented with clinical decompensation manifesting as worsened functional class or clinical right heart failure.7 Importantly, patients who converted to sinus rhythm improved clinically, while those refractory to rhythm control (all of whom had AF) had a mortality rate of 82 % over an average of 11 months post atrial arrhythmia diagnosis. This pattern of clinical decline in the setting of atrial arrhythmias was also seen in a similar retrospective cohort study, which showed reductions in 6-minute walk tests that recovered with restoration of sinus rhythm33 and in an Italian PH cohort that showed a significant worsening of echocardiographic measures of right heart function and an increase in brain natriuretic peptide levels among patients with atrial arrhythmias.8 The Olsson et al. study found that nearly all (97.5 %) patients with atrial arrhythmias developed clinical deterioration with worsened functional class or right heart failure.9 The 5-year mortality rate for patients with AF who were refractory to rhythm control was as high as 78 %, compared with 32 % in patients who remained arrhythmia free. There were no baseline differences in haemodynamic parameters, functional status or natriuretic peptide levels among those who achieved restoration of sinus rhythm and those who did not. Patients in whom a rhythm control strategy was successful experienced outcomes similar to those who had no incident arrhythmias. Recognising the limitations of observational studies, these data suggest that the maintenance of sinus rhythm, when feasible, should be considered a treatment goal in patients with PH. Multiple mechanisms may account for the clinical deterioration seen in PH patients who develop atrial arrhythmias (see Figure 2). The negative effect on cardiac output from the loss of atrial contraction, loss of atrioventricular synchrony, and ventricular irregularity has been described in patients with atrial arrhythmia and left heart failure.34,35 These effects may be particularly severe for patients with established right ventricular dysfunction or clinical right heart failure as a result of long-term PH. Echocardiographic data suggest that patients with PH rely on active, rather than passive, atrial emptying to a greater degree than matched controls.36 Aside from decreased contractility, the tachycardia from a rapid ventricular response increases both pulsatile and resistive components of right ventricle (RV) afterload.37 The RV is significantly more sensitive to changes in afterload compared with the left ventricle,38 and the resultant increase in RV wall stress may exacerbate the already tenuous supply–demand relationship of coronary perfusion in these patients.39 Left ventricular systolic dysfunction resulting from chronic tachycardia has also been well described,40 but it is unclear as to what degree the RV can be preferentially affected by this pathophysiology. The management of AF and atrial flutter in patients with severe PH represents a clinical challenge, especially in those with tenuous RV function or frankly decompensated right heart failure. In these settings rate-control agents with negative inotropic effects (beta-blockers, calcium channel blockers) are poorly tolerated. There are no randomised studies comparing rate and rhythm control specifically in PH populations and these patients have typically been excluded from clinical trials on AF therapy. Given the poor tolerance of these arrhythmias and their association with adverse outcomes, most observational studies of patients with PH and atrial arrhythmias report an initial attempt at rhythm control strategy.7–9,41 Rhythm control is currently recommended as the preferred approach in the European Society of Cardiology and European Respiratory Society guidelines for PH management.42 Rhythm control strategies have included pharmacological cardioversion with membrane-active antiarrhythmic drugs, electrical cardioversion and catheter ablation. All studies investigating rhythm control strategies to date have included small numbers of patients and, in general, no standardised approach to rhythm control has been described. The use of class III agents such as amiodarone and sotalol has been reported in patients with PH,7–10 with amiodarone perhaps having an advantage due to its rather neutral effect on cardiac contractility. However, the long-term use of amiodarone may not be an option in patients with PH secondary to comorbid parenchymal lung disease and poor pulmonary function reserve. For patients treated with the endothelin receptor antagonist bosentan, amiodarone can increase bosentan levels via inhibition of cytochrome P450 (CYP)2C9 and should be used with caution.43 Dronedarone is contraindicated in patients who have advanced heart failure, including those in whom the heart failure is due to PH. Class IC agents such as propafenone or flecainide are theoretical considerations, although it is not clear to what extent the adverse outcomes seen in patients with structural heart disease44 may extend to patients with PH with or without RV dysfunction. Similar to patients without PH, catheter ablation is a first-line approach to the management of cavotricuspid isthmus (CTI)-dependent atrial flutter in patients with PH. 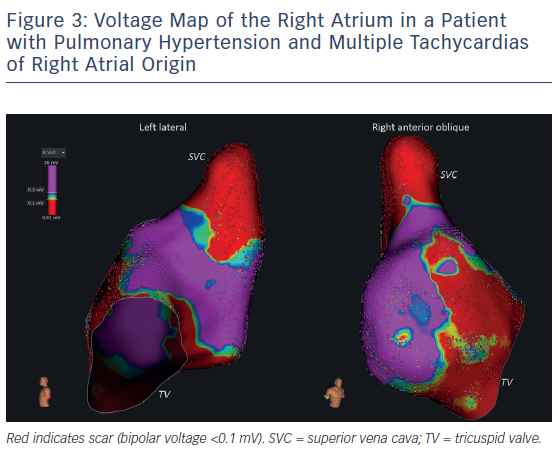 Due to the RA and tricuspid annular dilation in patients with PAH, CTI ablation is often more technically challenging than in patients with structurally normal right heart chambers. In a retrospective analysis of a single-centre experience with CTI ablation in 38 patients with PAH, bidirectional block was achieved in all patients; however, the PAH group had significantly longer procedure times (mean 78 minutes versus 62 minutes; p=0.03), required a larger number of ablation lesions (26 versus 19; p=0.02) and had a longer total ablation time (mean 20 minutes versus 15 minutes; p=0.02) compared with the group of patients without PAH.45 A similar trend (yet not statistically significant) toward longer CTI ablation procedures in patients with PAH versus controls was reported in a smaller series of 12 patients.46 It is worth noting that PH with associated RA remodelling may alter the typical electrocardiographic presentation of CTI-dependent flutter, as the same study reported the classic saw tooth pattern in only 42 % of PAH cases as compared with 100 % of controls. In patients with PAH, flutter waves often had lower amplitude with a cycle length that was significantly longer compared with controls (295 ± 53 ms versus 252 ± 35 ms). Despite the technical challenges in these patients, the acute and long-term success of catheter ablation of CTI-dependent flutter is favourable. Although multiple randomised and non-randomised studies have investigated the use of catheter ablation in patients with AF,47–49 the safety and efficacy of ablation techniques for AF specifically in the PH population is uncertain and no published reports of AF ablation (or other left atrial ablation) exist in this patient population to date. While the pulmonary veins (PVs) are still the most promising ablation targets in patients with PH, it is possible that non-PV triggers may play a more important role than in patients without PH due to ultrastructural and electrical remodelling of the RA. In an unselected population with paroxysmal and persistent AF, non-PV triggers were identified in approximately 11 % of cases.50 Approximately half of those non-PV triggers originated in the RA, including the crista terminalis/eustachian ridge, superior vena cava and tricuspid annulus. In a recent study of patients with obstructive sleep apnea (OSA) who underwent ablation procedures for paroxysmal AF, residual non-PV triggers were found in nearly 42 % of patients after PV isolation.51 Notably, patients with OSA were found to have some of the electrophysiological abnormalities previously described in patients with PH (lower atrial voltage and slower conduction velocities). By extension, due to this phenotypic overlap between OSA and PH, patients with PH may also have a higher prevalence of non-PV triggers compared with the general AF population. In addition, focal atrial tachycardias, non-CTI-dependent atypical atrial flutters, and multiple flutter circuits are not uncommon in these patients due to the extensive atrial remodelling. Another special consideration in patients with severely elevated right heart pressures is the risk of complications from transseptal puncture and left atrial access for ablation procedures. This is particularly important with the use of the cryoballoon ablation system that requires a larger sheath for delivery than the standard radiofrequency ablation catheters. While iatrogenic atrial septal defects (ASDs) are possible with any transseptal procedure, the cryoballoon technique has been associated with a significantly higher incidence of persistent ASD.52 The clinical consequences of these ASDs have not been established, but, in theory, a significant residual ASD in a patient with PH and elevated right heart filling pressures might result in clinically significant intracardiac right-to-left shunting and hypoxaemia, as well as an increased risk of paradoxical embolism. PH patients with baseline hypoxaemia due to ventilation-perfusion mismatch may suffer further clinical deterioration with a second insult. Lastly, patients with severe PH generally have a high anaesthetic risk53 that is partially attributable to the unfavourable cardiopulmonary circulatory changes associated with mechanical ventilation. Thus, the benefits of catheter ablation procedures in these patients should be carefully weighed against the risks of deep sedation or general anaesthesia. Procedural anaesthesia in patients with severe PH should be performed under the supervision of experienced personnel with expertise in cardiac anaesthesiology. A number of unresolved questions regarding the use of anticoagulation in patients with PH (with or without atrial arrhythmias) remain. It is unknown whether the presence of PH and right heart enlargement and/or dysfunction allows for reliable risk estimation with the use of the traditional CHA2DS2VASc score, which incorporates systemic hypertension and congestive heart failure.54 In terms of the choice of anticoagulation agent, there are no obvious contraindications to the use of direct oral anticoagulants in patients with PH. Patients with PH were not specifically excluded from the clinical trials that led to the establishment of direct oral anticoagulants as first-line agents for stroke risk reduction in the management of AF and these agents continue to be used for an expanding spectrum of indications, often with superior safety and efficacy profiles as compared with warfarin.55 However, safety and efficacy data for direct oral anticoagulants specifically pertaining to the PH population are lacking. Clinicians pursuing stroke prophylaxis with these agents also need to be mindful of potential drug–drug interactions relevant to PH therapies. For example, bosentan is a known inducer of CYP3A4, an important metabolic clearance pathway for rivaroxaban and apixaban.56 Use of additional CYP3A4 inducers or drugs affecting other degradation pathways may result in subtherapeutic anticoagulation with these agents. A summary of specific management recommendations of atrial arrhythmias in patients with PH is shown in Table 2. Atrial arrhythmias are common in patients with PH. Whether these arrhythmias are the cause or consequence of worsening RV failure in these patients is not certain; however, haemodynamic data suggest that PH patients are especially vulnerable to haemodynamic stress during tachycardia and loss of coordinated atrioventricular contraction. Regardless, atrial arrhythmias require prompt intervention as failure to adequately control these arrhythmias may be associated with an unfavourable clinical course in this patient population. Observational studies have shown that a variety of rhythm-control strategies are feasible. As novel pharmacological treatments for PH and the continued improvement of multidisciplinary care improve survival in these patients,57 arrhythmias are likely to become a more prevalent complication of the disease. Future investigation in the field should clarify the remaining questions related to atrial arrhythmias in patients with PH, including the role of ambulatory rhythm monitoring, the role and timing of rhythm-control strategies, and the technical aspects and outcomes of catheter ablation. Pulmonary hypertension (PH) is a progressive disease that is commonly accompanied by the presence of atrial arrhythmias, which are associated with disease severity and deterioration in PH. European guidelines recommend that, where feasible, sinus rhythm control is the preferred first-line approach in the management of atrial arrhythmias in PH. In patients with PH and cavotricuspid isthmus-dependent atrial flutter in patients with PH, catheter ablation should be considered as first-line. Simonneau G, Gatzoulis MA, Adatia I, et al. 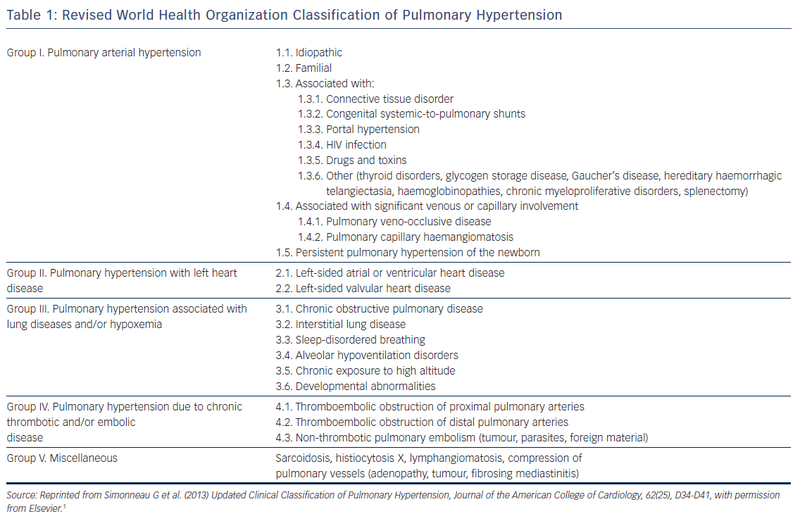 Updated clinical classification of pulmonary hypertension. J Am Coll Cardiol 2013;62(25 Suppl):D34-41. McLaughlin VV, Shah SJ, Souza R, Humbert M. Management of pulmonary arterial hypertension. J Am Coll Cardiol 2015;65:1976–97. Rottlaender D, Motloch LJ, Schmidt D, et al. Clinical impact of atrial fibrillation in patients with pulmonary hypertension. PLoS One 2012;7:e33902. Konecny T, Park JY, Somers KR, et al. Relation of chronic obstructive pulmonary disease to atrial and ventricular arrhythmias. Am J Cardiol 2014;114:272–7. Kanmanthareddy A, Reddy YM, Boolani H, et al. Incidence, predictors, and clinical course of atrial tachyarrhythmias in patients with pulmonary hypertension. J Interv Card Electrophysiol 2014;41:9–14. Humbert M. Pulmonary arterial hypertension and chronic thromboembolic pulmonary hypertension: pathophysiology. Eur Respir Rev 2010;19:59–63. Tongers J, Schwerdtfeger B, Klein G, et al. Incidence and clinical relevance of supraventricular tachyarrhythmias in pulmonary hypertension. Am Heart J 2007;153:127–32. Cannillo M, Grosso Marra W, Gili S, et al. Supraventricular arrhythmias in patients with pulmonary arterial hypertension. Am J Cardiol 2015;116:1883–9. Olsson KM, Nickel NP, Tongers J, Hoeper MM. Atrial flutter and fibrillation in patients with pulmonary hypertension. Int J Cardiol 2013;167:2300–5. Wen L, Sun ML, An P, et al. Frequency of supraventricular arrhythmias in patients with idiopathic pulmonary arterial hypertension. Am J Cardiol 2014;114:1420–5. Heeringa J, van der Kuip DA, Hofman A, et al. Prevalence, incidence and lifetime risk of atrial fibrillation: The rotterdam study. Eur Heart J 2006;27:949–53. Lloyd-Jones DM, Wang TJ, Leip EP, et al. Lifetime risk for development of atrial fibrillation: The framingham heart study. Circulation 2004;110:1042–6. Benjamin EJ, Levy D, Vaziri SM, et al. Independent risk factors for atrial fibrillation in a population-based cohort. the framingham heart study. JAMA 1994;271:840–4. Witte C, Meyer Zur Heide Genannt Meyer-Arend JU, Andrie R, et al. Heart rate variability and arrhythmic burden in pulmonary hypertension. Adv Exp Med Biol 2016;934:9–22. Vaziri SM, Larson MG, Benjamin EJ, Levy D. Echocardiographic predictors of nonrheumatic atrial fibrillation. the framingham heart study. Circulation 1994;89:724–30. Verheule S, Wilson E, Everett T 4th, et al. Alterations in atrial electrophysiology and tissue structure in a canine model of chronic atrial dilatation due to mitral regurgitation. Circulation 2003;107:2615–22. Raymond RJ, Hinderliter AL, Willis PW, et al. Echocardiographic predictors of adverse outcomes in primary pulmonary hypertension. J Am Coll Cardiol 2002;39:1214–9. Grapsa J, Gibbs JS, Cabrita IZ, et al. The association of clinical outcome with right atrial and ventricular remodelling in patients with pulmonary arterial hypertension: Study with real-time three-dimensional echocardiography. Eur Heart J Cardiovasc Imaging 2012;13:666–72. Siontis KC, Geske JB, Gersh BJ. Atrial fibrillation pathophysiology and prognosis: Insights from cardiovascular imaging. Circ Cardiovasc Imaging 2015;8:pii: e003020. Oakes RS, Badger TJ, Kholmovski EG, et al. Detection and quantification of left atrial structural remodeling with delayed-enhancement magnetic resonance imaging in patients with atrial fibrillation. Circulation 2009;119:1758–67. Marrouche NF, Wilber D, Hindricks G, et al. Association of atrial tissue fibrosis identified by delayed enhancement MRI and atrial fibrillation catheter ablation: The DECAAF study. JAMA 2014;311:498–506. Medi C, Kalman JM, Ling LH, et al. Atrial electrical and structural remodeling associated with longstanding pulmonary hypertension and right ventricular hypertrophy in humans. J Cardiovasc Electrophysiol 2012;23:614–20. John B, Stiles MK, Kuklik P, et al. Electrical remodelling of the left and right atria due to rheumatic mitral stenosis. Eur Heart J 2008;29:2234–43. Bandorski D, Bogossian H, Ecke A, et al. Evaluation of the prognostic value of electrocardiography parameters and heart rhythm in patients with pulmonary hypertension. Cardiol J 2016;23:465–72. Velez-Roa S, Ciarka A, Najem B, et al. Increased sympathetic nerve activity in pulmonary artery hypertension. Circulation 2004;110:1308–12. Chen SL, Zhang FF, Xu J, et al. Pulmonary artery denervation to treat pulmonary arterial hypertension: The single-center, prospective, first-in-man PADN-1 study (first-in-man pulmonary artery denervation for treatment of pulmonary artery hypertension). 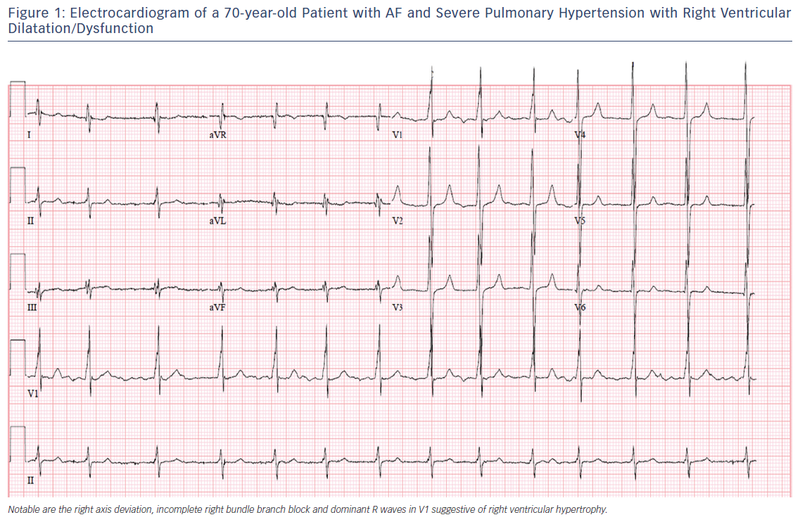 J Am Coll Cardiol 2013;62:1092–100. Katritsis DG, Pokushalov E, Romanov A, et al. Autonomic denervation added to pulmonary vein isolation for paroxysmal atrial fibrillation: A randomized clinical trial. J Am Coll Cardiol 2013;62:2318–25. Chen PS, Chen LS, Fishbein MC, et al. Role of the autonomic nervous system in atrial fibrillation: Pathophysiology and therapy. Circ Res 2014;114:1500–15. Zhao Q, Deng H, Jiang X, et al. Effects of intrinsic and extrinsic cardiac nerves on atrial arrhythmia in experimental pulmonary artery hypertension. Hypertension 2015;66:1042–9. Grigioni F, Avierinos JF, Ling LH, et al. Atrial fibrillation complicating the course of degenerative mitral regurgitation: determinants and long-term outcome. J Am Coll Cardiol 2002;40:84–92. Siontis KC, Geske JB, Ong K, et al. Atrial fibrillation in hypertrophic cardiomyopathy: Prevalence, clinical correlations, and mortality in a large high-risk population. J Am Heart Assoc 2014;3:e001002. Sartipy U, Dahlstrom U, Fu M, Lund LH. Atrial fibrillation in heart failure with preserved, mid-range, and reduced ejection fraction. JACC Heart Fail 2017;5:565–74. Ruiz-Cano MJ, Gonzalez-Mansilla A, Escribano P, et al. Clinical implications of supraventricular arrhythmias in patients with severe pulmonary arterial hypertension. Int J Cardiol 2011;146:105–6. Clark DM, Plumb VJ, Epstein AE, Kay GN. Hemodynamic effects of an irregular sequence of ventricular cycle lengths during atrial fibrillation. J Am Coll Cardiol 1997;30:1039–45. Pozzoli M, Cioffi G, Traversi E, et al. Predictors of primary atrial fibrillation and concomitant clinical and hemodynamic changes in patients with chronic heart failure: A prospective study in 344 patients with baseline sinus rhythm. J Am Coll Cardiol 1998;32:197–204. Willens HJ, Fertel DP, Qin J, et al. Effects of age and pulmonary arterial hypertension on the different phases of right atrial function. Int J Cardiovasc Imaging 2008;24:703–10. Metkus TS, Mullin CJ, Grandin EW, et al. Heart rate dependence of the pulmonary resistance x compliance (RC) time and impact on right ventricular load. PLoS One 2016;11:e0166463. Haddad F, Hunt SA, Rosenthal DN, Murphy DJ. Right ventricular function in cardiovascular disease, part I: Anatomy, physiology, aging, and functional assessment of the right ventricle. Circulation 2008;117:1436–48. Bogaard HJ, Abe K, Vonk Noordegraaf A, Voelkel NF. The right ventricle under pressure: Cellular and molecular mechanisms of right-heart failure in pulmonary hypertension. Chest 2009;135:794–804. Gopinathannair R, Etheridge SP, Marchlinski FE, et al. Arrhythmia-induced cardiomyopathies: Mechanisms, recognition, and management. J Am Coll Cardiol 2015;66:1714–28. Malaczynska-Rajpold K, Komosa A, Blaszyk K, et al. The management of supraventricular tachyarrhythmias in patients with pulmonary arterial hypertension. Heart Lung Circ 2016;25:442–50. Galie N, Humbert M, Vachiery JL, et al. 2015 ESC/ERS guidelines for the diagnosis and treatment of pulmonary hypertension: The joint task force for the diagnosis and treatment of pulmonary hypertension of the european society of cardiology (ESC) and the european respiratory society (ERS): Endorsed by: Association for european paediatric and congenital cardiology (AEPC), international society for heart and lung transplantation (ISHLT). Eur Heart J 2016;37:67–119. Dwyer N, Kilpatrick D. Bosentan for the treatment of adult pulmonary hypertension. Future Cardiol 2011;7:19–37. Luesebrink U, Fischer D, Gezgin F, et al. Ablation of typical right atrial flutter in patients with pulmonary hypertension. Heart Lung Circ 2012;21:695–9. Bradfield J, Shapiro S, Finch W, et al. Catheter ablation of typical atrial flutter in severe pulmonary hypertension. J Cardiovasc Electrophysiol 2012;23:1185–90. Morillo CA, Verma A, Connolly SJ, et al. Radiofrequency ablation vs antiarrhythmic drugs as first-line treatment of paroxysmal atrial fibrillation (RAAFT-2): A randomized trial. JAMA 2014;311:692–700. Siontis KC, Ioannidis JPA, Katritsis GD, et al. Radiofrequency ablation versus antiarrhythmic drug therapy for Atrial Fibrillation: Meta-analysis of quality of life, morbidity, and mortality. JACC Clin Electrophysiol 2016;2:170–80. Arbelo E, Brugada J, Lundqvist CB, et al. Contemporary management of patients undergoing atrial fibrillation ablation: In-hospital and 1-year follow-up findings from the ESC-EHRA atrial fibrillation ablation long-term registry. Eur Heart J 2017;38:1303–16. Santangeli P, Zado ES, Hutchinson MD, et al. Prevalence and distribution of focal triggers in persistent and long-standing persistent atrial fibrillation. Heart Rhythm 2016;13:374–82. Anter E, Di Biase L, Contreras-Valdes FM, et al. Atrial substrate and triggers of paroxysmal atrial fibrillation in patients with obstructive sleep apnea. Circ Arrhythm Electrophysiol 2017;10:pii: e005407. Mugnai G, Sieira J, Ciconte G, et al. One year incidence of atrial septal defect after PV isolation: A comparison between conventional radiofrequency and cryoballoon ablation. Pacing Clin Electrophysiol 2015;38:1049–57. Pilkington SA, Taboada D, Martinez G. Pulmonary hypertension and its management in patients undergoing non-cardiac surgery. Anaesthesia 2015;70:56–70. January CT, Wann LS, Alpert JS, et al. 2014 AHA/ACC/HRS guideline for the management of patients with atrial fibrillation: A report of the american college of cardiology/american heart association task force on practice guidelines and the heart rhythm society. J Am Coll Cardiol 2014;64:e1–76. Siontis KC, Yao X, Gersh BJ, Noseworthy PA. Direct oral anticoagulants in patients with atrial fibrillation and valvular heart disease other than significant mitral stenosis and mechanical valves: A meta-analysis. Circulation 2017;135:714–6. Hellwig T, Gulseth M. Pharmacokinetic and pharmacodynamic drug interactions with new oral anticoagulants: What do they mean for patients with atrial fibrillation? Ann Pharmacother 2013;47:1478–87. Benza RL, Miller DP, Barst RJ, et al. An evaluation of long-term survival from time of diagnosis in pulmonary arterial hypertension from the REVEAL registry. Chest 2012;142:448–56.